The Center for Disease Control has recommended that all body fluids be treated as a potentially infectious material. 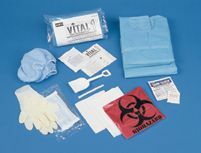 North Vital� 1 products, containing chlorinated absorbent beads, provide a fast, efficient method of absorption and disposal of body fluids. Both the Flat Pack and Econo-Kit contain everything needed to clean-up and dispose of a two gallon spill. The shaker bottle contains enough chlorinated absorbent beads to gel five gallons of fluid. Contains chlorinated absorbent beads. Contain everything needed to clean-up and dispose of a two gallon spill. 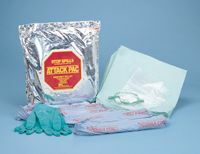 Provides a fast, efficient method of absorption and disposal of body fluids. This item cannot be shipped to APO/FPO addresses.